The best medieval epics strike a balance between ceremonial pomp and grimy vulgarity, allowing the modern couch-bound viewer to simultaneously marvel at the pageantry of the powerful and recoil at the brutal realities of daily life. More than the dragon-powered action scenes and tangled family trees, it's the tension between the public and private lives of the scheming leaders that makes HBO's fantasy saga Game of Thrones so endlessly watchable. Outlaw King, a blood-and-mud-caked retelling of the battle for Scottish independence in the early 14th century that just arrived on Netflix, also understands how to make these stories tick. The movie, which debuted in a reportedly lengthier version at the Toronto Film Festival earlier this year, needs all the help it can get to make its subject matter feel fresh. 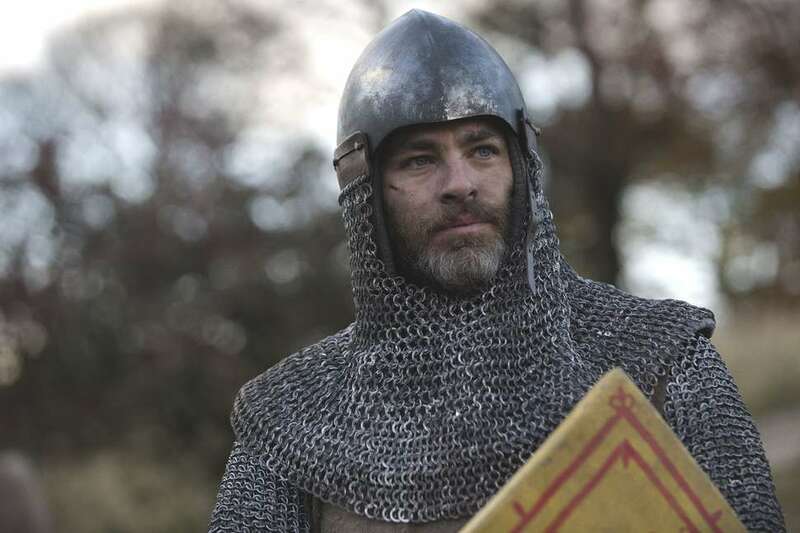 Star Trek's Chris Pine plays King Robert the Bruce, a figure who filmgoers might remember as a player in Mel Gibson's kilt-and-blue-paint '90s cable classic Braveheart. Outlaw King could be considered a part of a larger Braveheart Cinematic Universe, picking up after most of the action in that film and showing Robert's rise to power. A scene featuring William Wallace, the warrior Gibson portrayed in Braveheart, was cut from the film after its screening in Toronto, but his severed arm still makes a cameo. The problematic ghost of Gibson's often cheesy movie hangs over this film, too. As a filmmaker, director David Mackenzie takes a more reigned-in approach to European history. 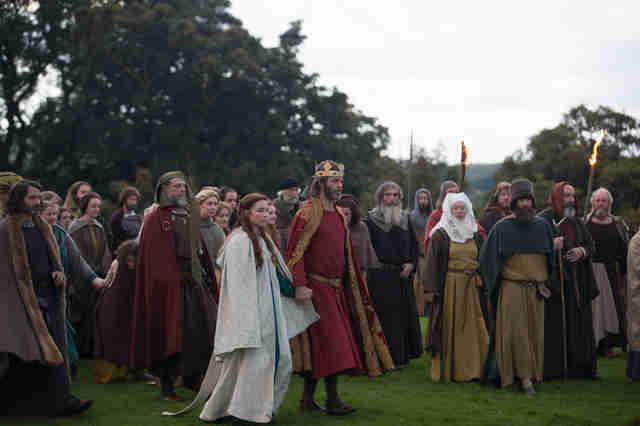 After a bit of text on screen establishes the time (1304) and the place (Scotland) along with some necessary context, the movie opens with an intricately staged, lengthy opening shot that shows Pine, rocking a mullet that wouldn't look out of place on a Def Leppard roadie, swearing fealty to English King Edward I (Stephen Dillane) and crossing swords with Edward's loathsome son, Prince Edward (Billy Howle). Eventually, Edward I uses a catapult to flex some military muscle. Mackenzie appears to be doing the same thing with his long take, but there's no discernible point to it and the movie soon switches to a more straightforward style. With a story like this -- one filled with shocking betrayals, daring escapes, and stomach-churning horse deaths -- the less flashy approach works. Robert the Bruce initially attempts to keep the truce with the English, but he's enraged by the cruelty of the King's army and begins creating alliances between different Scottish factions. (This includes a wild-eyed madman played with cartoonish intensity by Aaron Taylor-Johnson.) 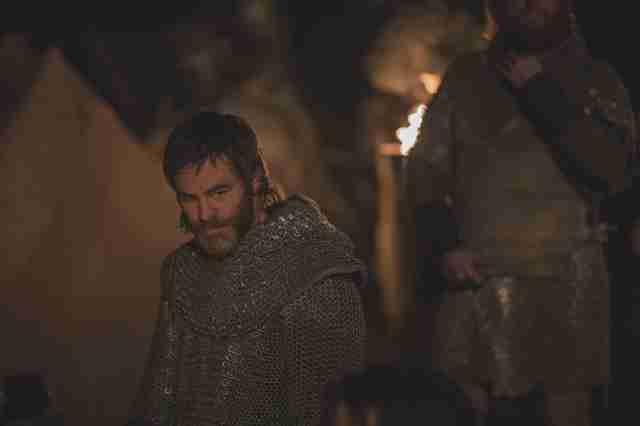 Despite its hefty $90 million budget, Outlaw King has a modesty to it that matches Robert's tactics-obsessed, ground-level leadership. He's not one for speeches; he doesn't sweep his new wife Elizabeth (Florence Pugh) off her feet with grand romantic gestures; he always remains focussed on the task in front of him. When the fighting breaks out, the combat is swift and chaotic. Instead of the slick, splash-page imagery of a movie like King Arthur: Legend of the Sword or 300, Mackenzie favors handheld cinematography that captures the immediacy and horror of watching men bash away at each other in a bog as bodily fluids spray in the sunlight. You've seen conflicts like this before. The more memorable sights, like Elizabeth being held in a cage above water and horse hooves crushing apples as they gallop, come in between the hacking. The last collaboration between Pine and Mckenzie, the Texas-set, Recession-era bank robbery yarn Hell or High Water was celebrated for its flimsy gestures towards political significance -- shots of foreclosed homes, dialogue referencing generational poverty, and a mood of bubbling populist anger -- but its real pleasures were more surface level. The ruffled, lived-in performances and the clever, artfully deployed twists on crime movie tropes were what made the material pop. Not the broader themes. It was a smartly executed yarn with little shavings of ambition sprinkled on top. Similarly, Outlaw King's probing of nationalism as a concept isn't particularly deep. The villains are so clearly bad and the heroes are so clearly good that the occasional moments of moral ambiguity, like any time Pine gazes in blank terror at the violence around him, come off as superfluous. Tellingly, the writers are fond of Dark Knight-like declarative statements like "power is making decisions" and "he wasn't a man -- he was an idea!" Outlaw King is often rousing, but it never connects the man at its center to an actual idea that's worth thinking about after the credits roll. Instead, you'll likely be left chuckling at the haircuts and glad you're not covered in dirt.